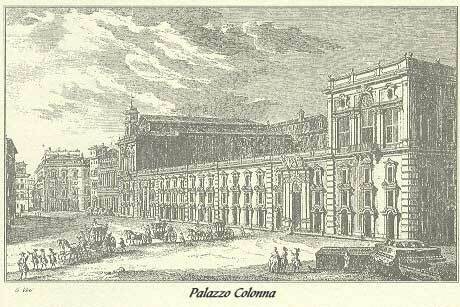 The Coffee House of Palazzo Colonna is located in the Southeast pavilion of the building’s perimeter. It was built between 1730 and 1733, commissioned by Prince Fabrizio IV. As for its artistic value, the pavilion is one of the best examples of the Roman Rococo, a style that in Rome is not as common as the Baroque. The interior of the Coffee House, described by Pinto as “the most delightful and delicate eighteenth-century space in Rome”, particularly stands out for its harmony. The wonderful angle perspective inside the pavilion, a work by the famous architect Nicola Michetti, gives the spectator the impression that the space is wider and more dynamic than it actually is. Moreover, on the building’s walls you can find some ancient bas-reliefs, most of which date back to the most refined period of the Roman art, the one between Augustus’ and Hadrian’s reigns. The decoration of the ceiling was made by painter Francesco Mancini, a student of the famous artist Guido Reni. It portrays the final and triumphal scene of the romantic myth of Psyche, the “Psyche’s Apotheosis”, commendably executed and perfectly preserved on the vaulted ceiling of the Coffee House..